In a large mixing bowl, sift together all dry ingredients. Add milk and water and mix well. Cut parchement paper into two 12 x 16 pieces. Lay one piece of parchement on a flat surface and scoop half of the dough onto the center. Flatten dough by hand and cover entire parchement with clear plactic wrap. Roll out the dough over the plastic wrap. The goal is to make the dough extremely thin with areas of near transparency. 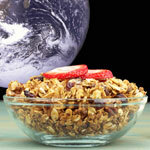 You may notice that you are in effect making one huge bran flake at this point. Remove the plastic wrap and place the dough (on the parchement) onto a 14 x 16 flat sheet pan. Cook for 10 minutes checking often after 5 minutes. A dough this thin will burn easily if left in too long. The resulting product after cooking will be a leathery thin cracker (crunchy at the edges). Repeat the rolling and cooking process with the other half of your dough. Reduce oven temperature to 275 degrees. After both huge bran flakes have completely cooled... rip and crack them into the sized flakes you are most familiar with (about 3/4 of an inch). Place all flakes on a large cookie sheet and cook at the reduced temperature for 20 minutes... stirring the and flipping the flakes every five minutes. Remove the pan from the oven and allow flakes to cool completely. Serve with milk and fresh fruit. Stores well in a sealed container for up to two weeks. 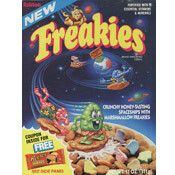 As seen on Mr Breakfast's upcoming appearance on the Food Network's "Secret Life Of... Cereal". 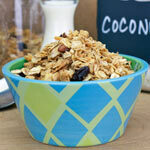 What do you think of Nutty Bran Flakes? Wish there was a photo of the finished product. I used a pasta maker to roll out the dough. First I flattened pieces unto a flour covered surface then put it through the pasta maker. Then I just put them on a cookie sheet with no parchment paper. This recipe is very yummy! The taste of the grain and nuts is amazing. I like having it with fruit. I wanted to find one where I could make it without adding sugar or sweetener. It works better with parchment paper, I tried tinfoil and it worked OK but was it was hard to remove the baked dough. It would be easy to add spices and flavors of choice. Nothing but plastic wrap works on top. Angi! You have to use plastic wrap to flatten the dough... plastic on top and parchment on bottom. The plastic wrap pulls off easily! 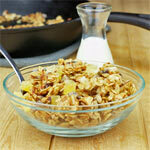 *I used organic bread flour instead of wheat and I love this cereal! I also sprinkled it with cinnamon/sugar mix for the kids. Going to experiment with gluten free flour next! What kind of bran is in the recipe? Wheat, oat or something else? I would like to know since I want to give this recipe a try. Used oat bran and wheat bran instead of wheat flour! OMG - this cereal tastes better than the stuff at the store! Thanks for this recipe! Do you think this would work with oat flour instead of wheat flour? We need it to be gluten-free. This is a really good recipe! I usually add raisins when I eat it, but the flakes are super toasty and yummy! What did I do wrong? My dough stuck to the parchment paper. I love this recipe. Followed the instructions carefully and I now have delicious cereal. Before baking, I drizzled honey over the dough. I wanted to apply honey with brush. But, did not want to damage the dough. So, drizzling worked very well. Would the flakes still turn out properly, if one used a pizza cutter to make the desired bite-sizes in the dough before baking? 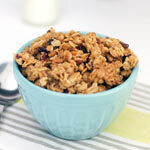 I had been looking for a recipe like this for a VERY LONG time, but I never could find a recipe for cereal that was other than granola-type. This recipe is amazing! It is just like the bran flakes you buy, but I'm sure a lot healthier without added ingredients. I like to experiment with this recipe (It's fairly lenient) and add extras like honey and cinnamon and nutmeg and flax seeds and other stuff that I feel like putting in it! 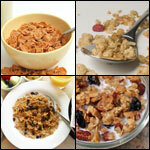 Create & Print a Custom Cereal Box for your homemade cereal!